A Channeled message of Love with St. Gabriel…. 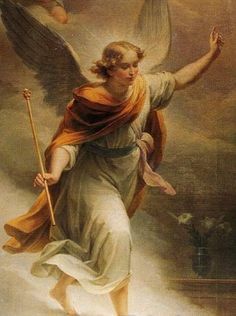 Greetings, I am St. Gabriel the messenger of God . God is wanting to let His Children know that His love is constant and available 24/7 . Imagine a waterfall of love , pouring down from Heaven now. This is from God’s Heart. Imagine now beloved, a waterfall of love , continuing through to your own heart. Tell your heart to open to God’s Love. Imagine now your heart opening and allow the waterfall of love into your heart. Ask God to send you a multitude of His angels to surround you and protect you. Imagine your heart wide open and allow His love to overflow in you. Overflow into every cell, every vessel, every chakra, every organ, every body system, and out pour into the air around around , your field of light. This will help you feel connected to him, which you are never separate. Open your heart to His Goodness. For nothing is hidden from you when asked of Him. Ask with sincerity in your heart for what you need. Ask in love for what you desire. Ask with faith and ask for God to assure you of His love for you. Listen to God when He speaks to you. Do not be afraid to hear his voice. His voice is bold, but wise, and loving. Bold with Truth and Grandeur. Bold with His love. Ask the angels to help you understand God’s Love for you if you do not. His love is beyond human understanding. His understanding beyond human understanding and He is loving you right now for asking . This is St. Gabriel the Archangel, and I am here to deliver God’s message to You. God is unconditionally loving, He is compassionate, He is Divine Compassion, He is Divine Mind, He is Divine Source, He is Divine Love and He is your Heavenly Father who loves you. Divine Compassion is different than human compassion-although you were created in the Image of God. You are able to love unconditionally beloved. As you allow your heart to open more fully each day, you will understand that compassion is very important in order to grow spiritually. Love is not hard beloved, even though sometimes you are tempted by the ego to think so. Love is grand. Love is what you are created from . Love is what your heavenly Father sees you with. Understand that God’s love is helping you , even now. Open your heart to Him every morning, every evening, every time you can. Open your heart to His Greatness and ask St. Gabriel to assist you in opening your heart. St. Michael will also help, and so will your guardian Angels , who love you and want to see you grow . Heaven is always willing to assist you. Jesus is also willing to help you, you need only ask . Ask to heal any aberrations, ask to heal your consciousness. Ask to send His Love now. God’s love. Into your heart, and overflow into every cell . Do this every morning. St. Raphael will help if you are seeking health of body, mind or emotion. He will help you open to the Love of God and replace any aberrations with the Holy Healing Light of St. Raphael. His Green emerald Light will help open your heart chakra and heal any misunderstanding, any arguments , heal any wounds, for this is what you have been asking, is to heal your inner sanctuary, your heart. Dear God thank you, Dear Jesus thank you, Dear St. Raphael , thank you, Dear St. Michael thank you. For you are blessed dear child of God. Dear Sweet Holy Child of the Most High. Dear Jesus, come into my heart. As I ask for you to be in my heart, please heal me Lord. I Invite you in now, bring your love Lord, and fill my heart with your Holy Peace, Your Holy grace and fill me completely with your Holy Divine Love that only you can fill me with. Dear Jesus, thank you. Namaste , Angel Blessings, and May God Bless your Day!